(5" x 3" 600 dpi jpeg, 2 MB) by Julie Marten. 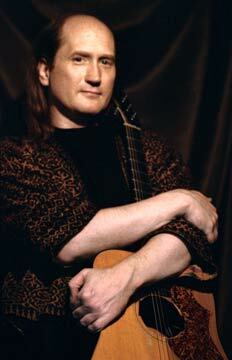 Shown: Matthew Montfort with scalloped fretboard guitar. This solo program by Matthew Montfort, the leader of the world fusion music ensemble Ancient Future, focuses on Montfort's ability to bring unusual tonalities from world music traditions to the guitar. It is a great option for solo guitar showcases, music festivals (easy staging), acoustic music round robins, house concerts, fine arts programs, educational programs, and yoga studios. Recognized as one of the world's 100 Greatest Acoustic Guitarists (DigitalDreamDoor.com), Matthew Montfort is a pioneer of the scalloped fretboard guitar (an instrument combining qualities of the South Indian vina and the steel string guitar). Montfort spent three months in intensive study with vina master K.S. Subramanian in order to fully apply the South Indian gamaka (note-bending) techniques to the guitar. He is also known for his work on Glissentar (an 11 string fretless guitar), flamenco guitar, electric guitar, sitar, charango, mandolin, and gamelan, and as Ancient Future's main composer. Matthew Montfort holds a B.A. in World Music and Composition and an M.A. in Arts and Media Technology from Antioch University. He has studied with the master musicians of many world music traditions, including sarangi master Ram Narayan, sarod master Ali Akbar Khan, mridangam master Guruvayoor Dorai, and gamelan director K.R.T. Wasitodipuro. He has recorded with legendary world music figures ranging from Bolivian panpipe master Gonzalo Vargas to tabla maestros Swapan Chaudhuri and Zakir Hussain. He has performed concerts worldwide, including at the Festival Internacional de la Guitarra on the golden coast of Spain near Barcelona and the Mumbai Festival at the Gateway of India in Bombay. He has performed live on national radio and TV shows such as the Echoes Living Room Concerts on Public Radio International, and the Rachel Maddow Show on MSNBC. Montfort wrote the book Ancient Traditions – Future Possibilities, drawing from his years of study of many world music traditions to create a training method based on the rhythms of Africa, Bali, and India. Workshops and masterclasses are also available for many genres and specialties, including world music traditions, rock, jazz, folk, classical, flamenco, bass, ukulele, mandolin, charango, and music theory for guitar. Montfort is also available as part of a Global Guitar Summit featuring international acoustic guitar virtuosos performing solo and ensemble pieces. In addition to Matthew Montfort, the summit has included artists such as Italian guitarist and musicologist Giacomo Fiore, German fingerstyle guitarist Teja Gerken, Indian jazz guitarist Konarak Reddy, and American fingerstyle guitarist Tim Sparks. The music performed includes new arrangements of classical works, Celtic music, Indian classical, contemporary compositions, popular songs, and much more. Guitar Player Magazine Presents: Mattthew Montfort performing 'Purple Raga' on Glissentar 11 string fretless guitar. Originally recorded on Seven Serenades for Scalloped Fretboard Guitar. Watch on guitarplayer.com (uses Flash). Mattthew Montfort performs 'Soul Serenade' from Seven Serenades for Scalloped Fretboard Guitar. The Rachel Maddow Show on MSNBC Presents Matthew Montfort on Godin Glissentar (11 string fretless guitar), and Bui Huu Nhut on dan bau (Vietnamese single string instrument) at the Festival of Music for People and Thingamajigs. This clip can also be viewed on nbcnews.com. Amber (Montfort. 2:09) iTunes. >YTmusic. FREE MP3 (excerpt). 459K. From Guitar Works by various guitarists. (Narada Lotus ND-61032) CD- $16.98: Add 1 to Cart. Buy 1 Now. Soul Serenade (Montfort. 6:28) iTunes. >YTmusic. From Seven Serenades for Scalloped Fretboard Guitar by Matthew Montfort. (Ancient-Future.Com AF 2008). Pre-Release Signed CD- $24.98: Add 1 to Cart. Buy 1 Now. I Mett Her in the Medowe, a and b (traditional, arr. Montfort. 5:31) iTunes. >YTmusic. Scottish lute melody from 1615. From Planet Passion by Ancient Future. (Ancient-Future.Com AF-2001). CD/Gift Card, $17.98: Add 1 to Cart. Buy 1 Now. "Montfort’s newest album, Seven Serenades, is remarkably similar to a classical Hindustani improvised performance. There are brief guest spots featuring supportive background performances of didjeridu, santoor, and violin, but most tracks are single note melodies on guitar, accompanied by nothing but an unobtrusive drone. The basic form of most of the tracks is the Hindustani alap/jhor/jhala, that slowly explores every part of the selected scale, first with no rhythm at all, then with a slowly increasing rhythmic pulse that builds to a heavily strummed crescendo. "But although some of the scales on this album are based on traditional ragas, they do not come from a single guru, but from every corner of Montfort’s diverse musical history. 'Celtic Raga' is based on the Hindustani scale khamaj, known as mixolydian in the west, which is the basis for many Irish fiddle tunes. Montfort’s interpretation starts by evoking a slow Celtic air, then gradually falls into the structure of a dancing Irish reel as it picks up tempo. 'Lilalit' is built on the challenging scale of raga lalit. Montfort’s interpretation combines the broad stark intervals of that raga to reveal jazzy chords that sound dissonant at first, but are actually following a special kind of consonance. 'Purple Raga' unpacks the melodic rules contained within the guitar riff of the famous Jimi Hendrix song 'Purple Haze' and reveals some powerful connections between Afro-American and Hindustani musical roots. "Matthew Montfort is a true guitar master. His instrument conveys the smallest nuances of the artist’s emotions. Also, Matthew Montfort’s manner of playing scalloped fretboard guitar is very diverse. He masterfully combines a perfect performance with Eastern meditative approach. As a result his music sounds very unique. And it is filled with the delicate flavor of the East. "The artist is not afraid to improvise and to blend various genres in his guitar music. His 'Purple Raga' is adorned with the captivating drones of an Australian didgeridoo. I could name this composition as world raga rock. In general Matthew Montfort’s music goes beyond any boundaries. He is truly one of the world’s best guitarists. "I first realized Matthew Montfort was a true guitar wizard when he called me on the phone and played me one flawless Hendrix riff after another. We were in the seventh grade. By the time we escaped high school, Matt had gone acoustic, turning coffee house basements into his own planet with fierce improvisations touching on an occasional Spanish or Celtic launching pad." "Now a pioneering master of world fusion, Matt continues to travel, study, absorb and immerse himself in musics and traditions all over the globe. His knowledge and depth are staggering, yet he doesn't let it get in the way of the joy and spirit and soul that we like about music in the first place." "The sparkling presence and sustain you hear is not an amplified acoustic with a lot of reverb, but a scalloped fretboard guitar. Matt's the only person I know who can play one. Most rock musicians I've mentioned it to seem shocked that it even exists."